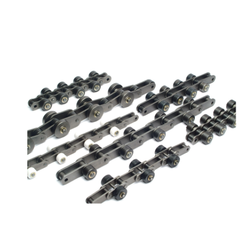 Our product range includes a wide range of special purpose conveyor chain. Owing to our vast experience of the industry, we are offering Special Purpose Conveyor Chains. The professionals of our firm design and manufacture these chains from 1 pitch to 24 pitch in compliance with international standards. These conveyor chains are extensively used for effective conveying unit load above the ground with an ability of horizontal and vertical movement at any path. All our products are rigorously tested by a team of quality analyzers on varied parameters before the final delivery.